Buzzfeed called upon the Pierateers to find out who sells the top rated football pies in the Birmingham area! The top social news website called upon our ex-pie-tise to advise on football pies, following our appearance on the BBC Sport website in their video on pies related to the Price of Football Survey and recent appearance on Rip Off Britain! For the Buzzfeed article we were sent to try the pies at the 5 Birmingham based football clubs - Aston Villa, Birmingham City, Walsall, West Brom and Wolverhampton. While only three of them made the final cut, find out who we rated the best in the Birmingham Pie League by viewing the article! While we are first and foremost a pie rating website, rather than specifically a football pie rating website, we’re looking to delve further into the provision of football pies as we develop our Pieremiership of football’s best half time pies. Find out if we've rated your club yet by clicking here! 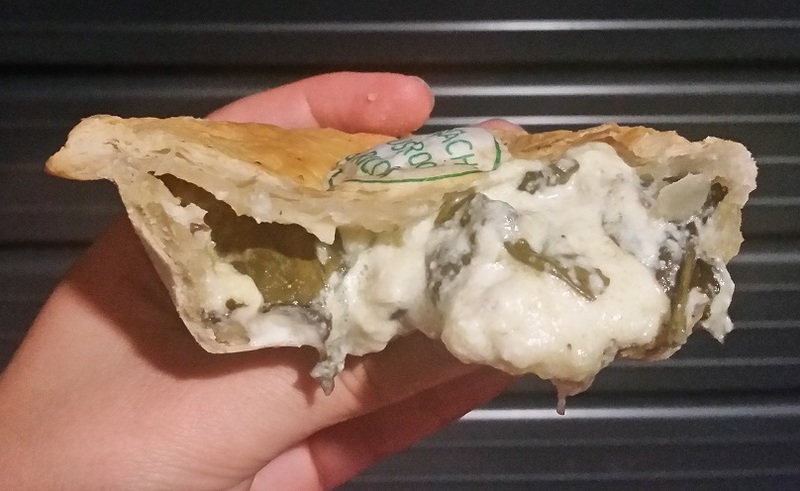 In our view, it’s all about a great tasting pie – filling and pastry - which is value for money. 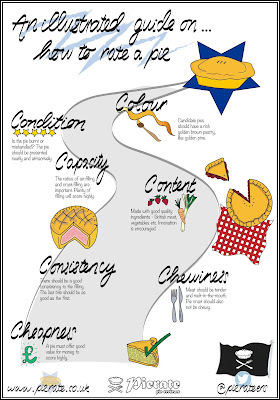 You can find out more about what makes a great rated pie by reading about the 7 Cs of pie rating. 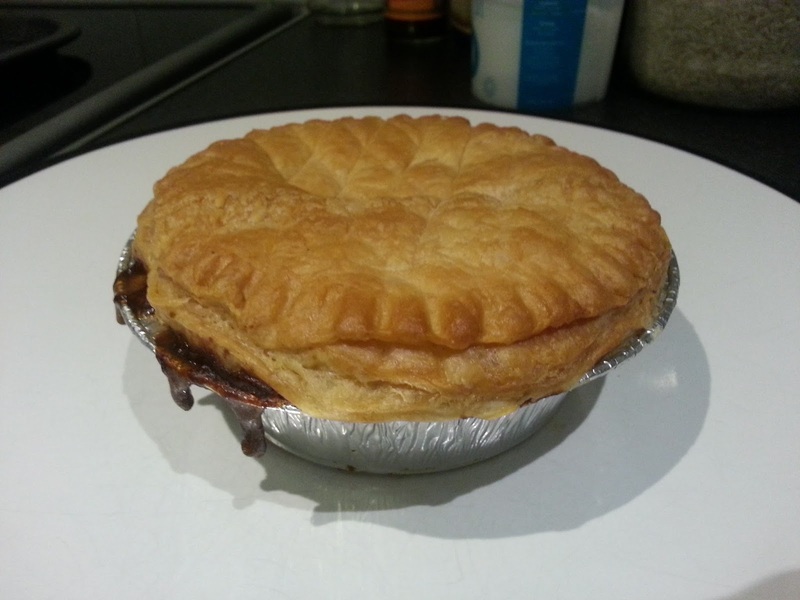 And to find out what makes a great football pie, you can also view our article on football pies when we advised BBC's Rip Off Britain earlier this year. 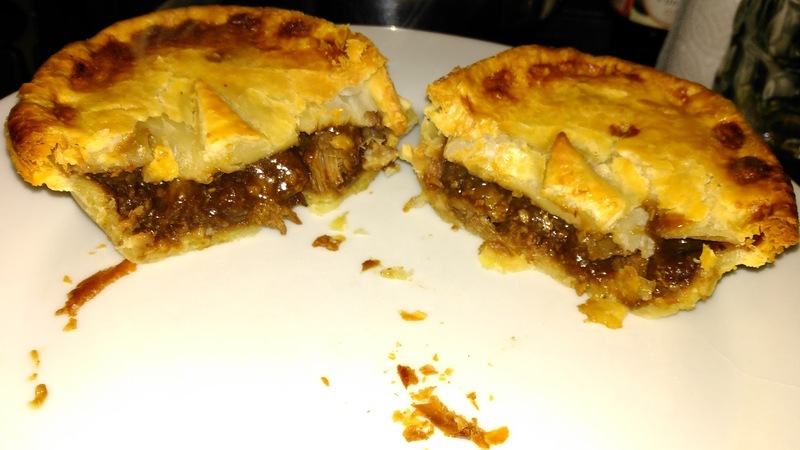 continue reading "We rate the West Midland's football pies for Buzzfeed"
Best Mince Pies in Britain? I saw this attention grabbing headline outside the Goodge Street branch of Konditor and Cook in London. 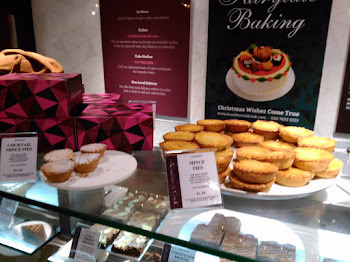 It was difficult to resist having a look at the mince pies which had such a claim to fame. This pastry and cake shop did look appealing, if a little expensive. The plate of mince pies on the counter looked impressive with a lovely golden colour to the pastry and a handmade appearances. The box of six pies I got were certainly beautifully presented but how would they taste? I personally found the flavour of these mince pies about right, there was a good balance between the fruit, spice and sweetness. I find some mince pies too spicy but these were more on the tangy and fruity side. There was a good texture with decent pieces of fruit and nut a must in this price range. For me, the pastry was also very nice, it was nice and buttery, a bit crumbly but not too much. 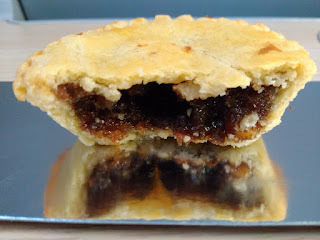 I find some mince pies have pastry almost like shortbread which is very crumbly and can be a bit dry. Pierateer RAS was also able to try these mince pies. 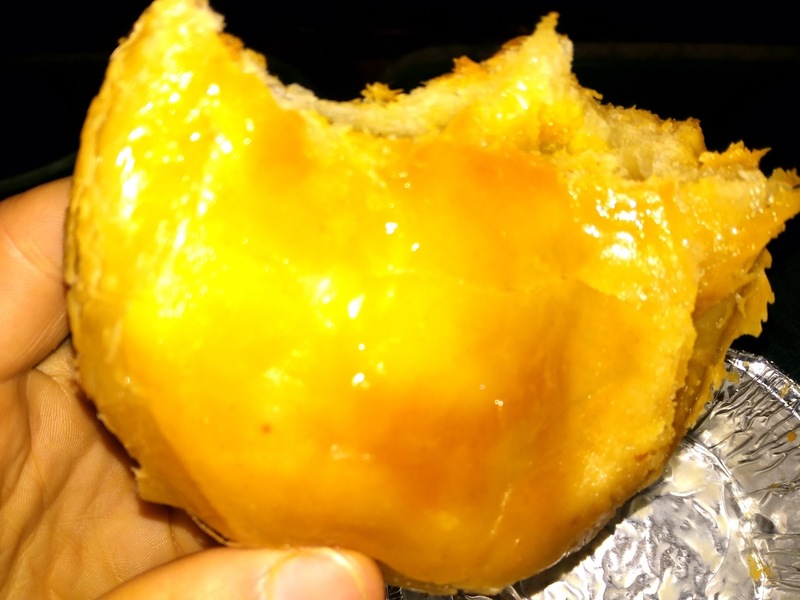 I was able to get Pierateer Rob's opinion on this, we were generally in agreement regarding the good quality of the buttery pastry and fruity filling. So these were nice mince pies, the taste and appearance was well above average. They were well filled with no airgap in sight. However, considering these were the larger of the two sizes of mince pies in Konditor and Cook, we noted they were really quite shallow. I really felt like I should have got a bit more considering the box of six cost me £8! It is always going to be difficult to justify paying such a high price. 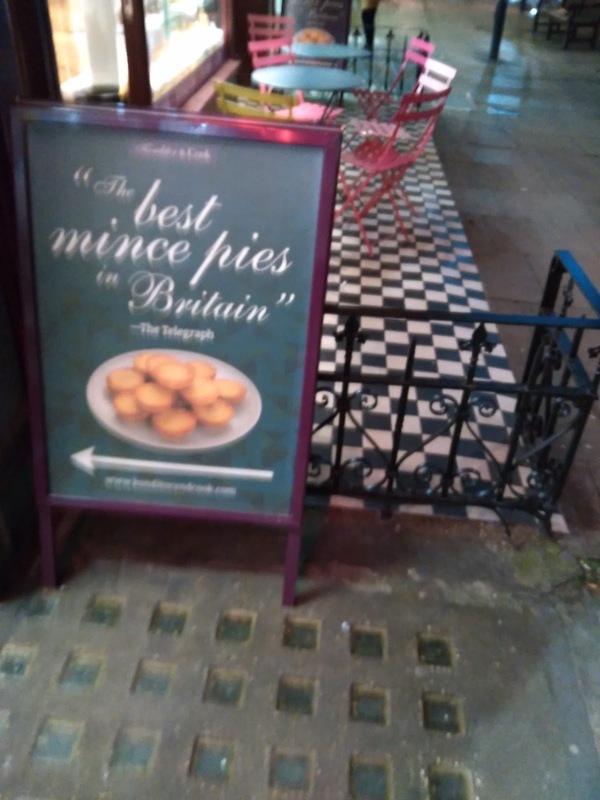 Regarding the 'best in Britain' claim, it is hard to verify this as I haven't tried all the mince pies in Britain. It was certainly up with the best but at the price you would expect that. I don't think it was the best mince pie I have ever had. 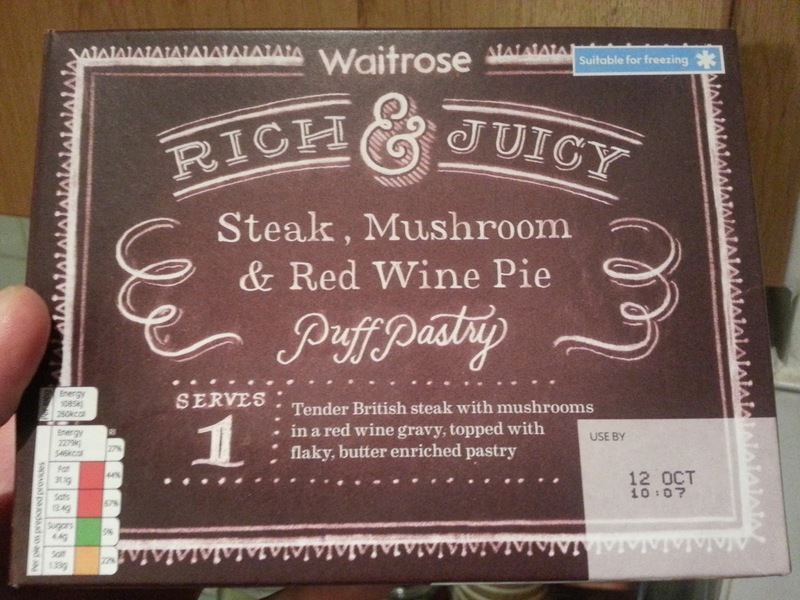 As it is nicely presented it could make a good gift but I am not likely to buy these pies again due to their premium price, you don't get that much more than with the best supermarket versions. The 'best mince pie in Britain' claim is attributed to the Telegraph but I have not been able to verify this via a Google search, their 2015 reviews online don't even mention Konditor and Cook! I don't doubt the claim but wouldn't put too much store in it, there are lots of mince pies out there recommended by various newspapers and website. However, it does come away with a 'Pierate Recommended' award for scoring above 5, that is something you can trust! continue reading "Best Mince Pies in Britain?" 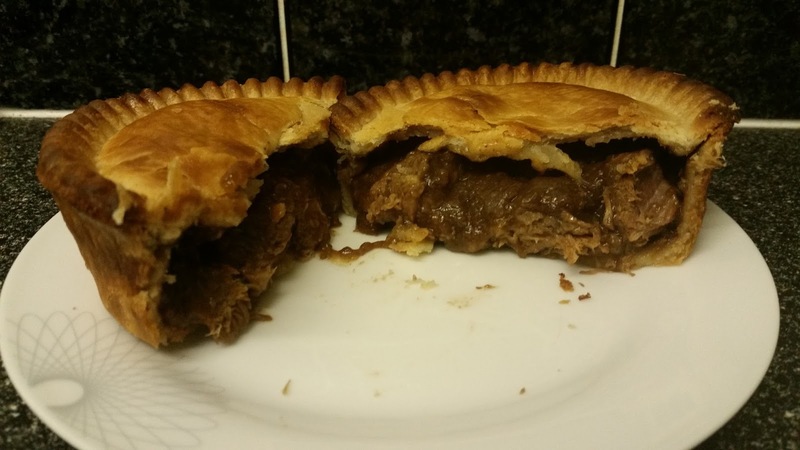 The BBC have once again called upon the Pierateers to find out what makes a great pie! 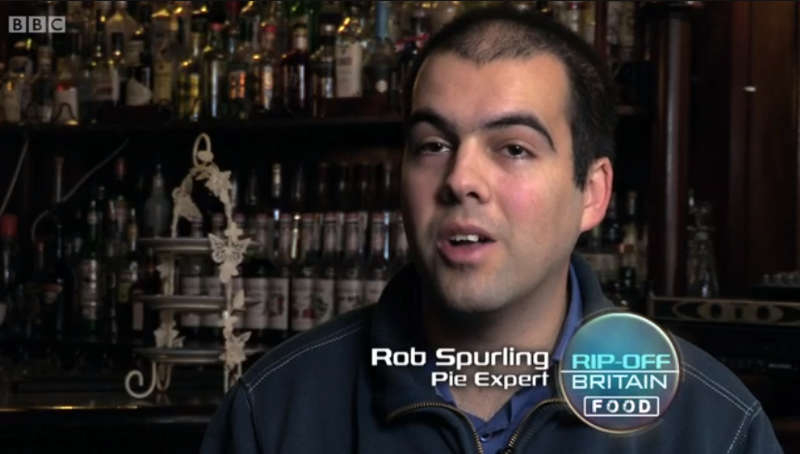 The team from BBC's Rip Off Britain called upon our ex-pie-tise to advise on football pies, following our TV debut on Great British Bake Off: An Extra Slice and appearing on the BBC Sport website in their video on pies related to the Price of Football Survey. Pierateer Rob - who was the chosen pie expert for the show - is seen talking about the quality of British football pies and whether they really are a rip off or not. For the eager pie-d among you, you'll know that the clip on Rip Off Britain this lunchtime was actually the same footage as back in April, but it's clearly a big talking point as it's been shown once again! In the clip (which can be view on BBC Pie-player for the next month and features us in the pie story from minute 18 to minute 26 and Pierateer Rob specifically in minute 22), Bradford City fan Kevin was questioning the quality and price of the pies at his local football club. Like us, Kevin thinks a half time pie is part and parcel of football culture in Britain. When you think football, you think half time pie. What better during those cold, winter evenings to warm the heart, as well as the hands, during the half time interval as you watch your local team? But is that actually what people do? 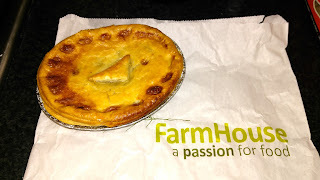 Or has the quality and price of football pies put off the regular football fan? Do the caterers even have enough pies to go round? And if fans do buy a pie, is it piefection or are football fans being held to ransom? Find out in the episode! We at www.pierate.co.uk will readily admit we are first and foremost a pie rating website, rather than specifically a football pie rating website, but we’re looking to delve further into the provision of football pies as we develop our Pieremiership of football’s best half time pies. But while we realise we haven’t eaten anywhere near enough pies in different football grounds yet – despite having over 500 pies rated in our Pie Rankings from many of the regular football pie manufacturers like Pukka Pies, Holland’s Pies and Peter’s Pies – we have always been a fan of eating a golden pastry product in the football stadiums we’ve visited. And in our minds what’s more important than simply the price of the pie is how the pie rates. Is it a soggy disappointment, overly dry or lacking in content or does it meet the 7 criteria we Pierateers look for in a pie? In our view, it’s all about a great tasting pie – filling and pastry - which is value for money. You can find out more about what makes a great rated pie by reading about the 7 Cs of pie rating. 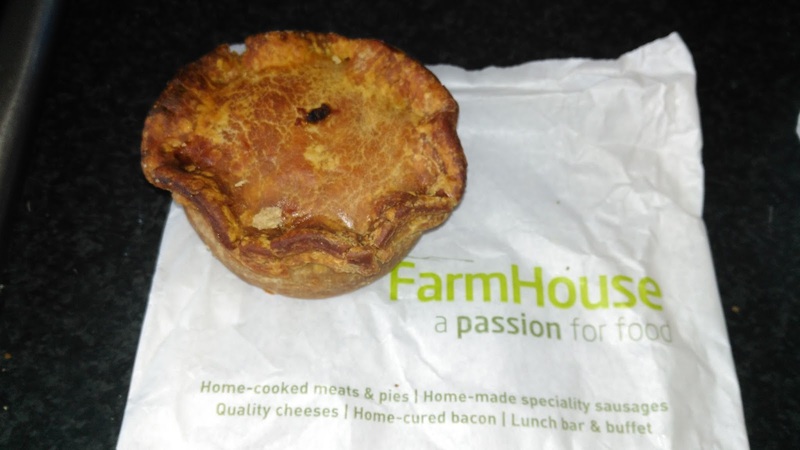 However what makes a great football pie? Firstly, it’s got to be cooked properly. Sadly, in the rush to serve so many customers in such a short space of time, food at football grounds can be undercooked or left sat in a hot locker for far too long, making the pie taste bad or even be pretty much inedible. We have unfortunately fallen foul to a few pies being served to us either undercooked or over baked. Naturally, the rating of such pies is badly affected. 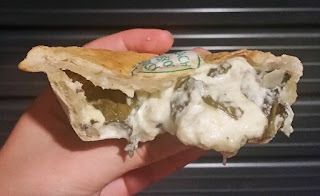 Secondly, the football pie has got to be something you can pick up in your hands and bite into, without it crumbling all over the place. 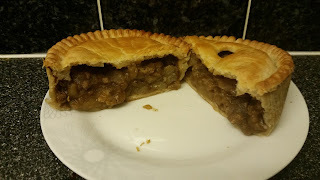 Quite a few football pies can be too soft to pick up or crumble all over the place when bitten into, so a firm but crisp pastry casing is key. Finally, the consistency of the pie filling has got to be just right. 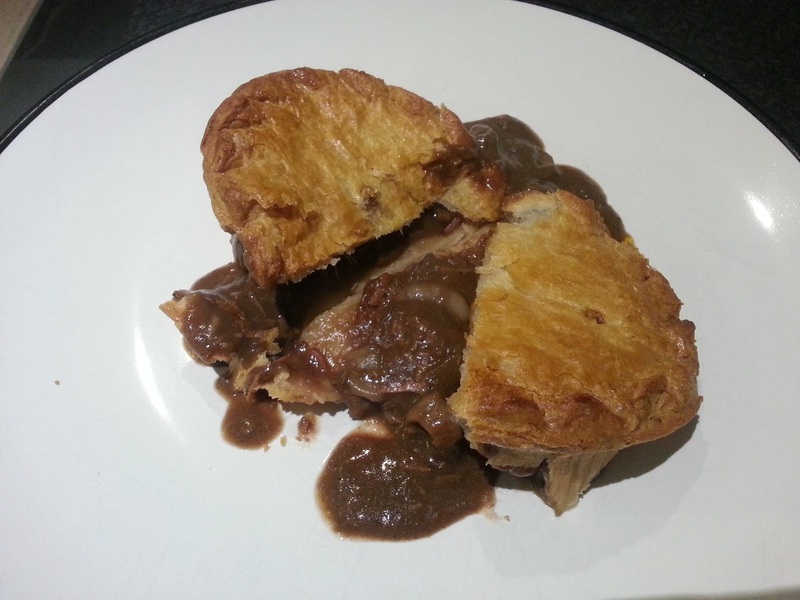 Naturally we want a meat pie to be filled to capacity with nice, tender meaty chunks, but we also expect the viscosity of the gravy or sauce to be well thought through so that it is flavoursome but not too runny, as the last thing you want is gravy down your football shirt! Morecambe FC won the British Pie Awards in 2012 and 2014! All this has got to be provided at a reasonable price that leaves the fan going away happy and without a huge dent in the wallet, otherwise it's certainly a rip-off! Featuring in the Rip Off Britain episode, one football ground has seemingly found the perfect reci-pie for the half time pastry snack, producing some of the highest rated pies on Pierate, let alone best football pies! 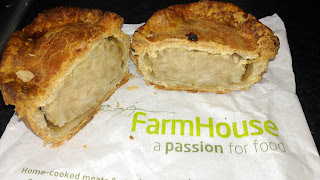 Head chef Graham Aimson at Morecambe FC has won several titles at the British Pie Awards for the quality of his pies, including being British Pie Awards Supreme Champion 2014, where unsurprisingly we were there as one of the judges. In summary, we think there’s nothing better than a warm, hearty pie to get you through half time. But the key thing is that they have got to be top rated pies! 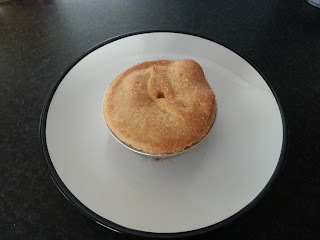 Too often the pies are not only overly expensive but are just not up to scratch, either too dry or undercooked. So as well as checking out the price of pies, we’ll be making sure we rate as many as possible on our 7 Cs of pie rating so that you know what pies to purchase and don't get ripped off! continue reading "Pierate advises BBC One's Rip Off Britain on football pies"
On Friday 25th September I was proud to be able to join pie regulars for my first real experience of a London Pie and Mash shop in full buzz, reports Pierateer Rob. It was a busy Friday lunchtime and the time was 13:11. Why do I know that? Well that’s when you need to be in the queue if you’re going to be dining with London’s premier pie and mash eating club – the aptly named “Pie and Mash Club”! For over 20 years now a group of pie lovers in London have been trying the traditional pie and mash in shops across the capital and beyond, recording their conquests to a level normally reserved for Opta’s football statisticians. The mind-child of Nick and a number of his work colleagues, the first official Pie and Mash Club meet up was in October 1994 and set the tone for a 1994/95 pie eating “season” which culminated in the first champion Richard Lucus. If nothing else, do check out the amazing directory of Traditional Pie and Mash shops that the Pie and Mash Club have recorded - it really is an amazing effort! The rules are pretty simple. 4 points for a pie, 3 points for mash, 4 for eels and 1 for liquor. You get an additional 2 points for “afters” such as a pie and custard dessert. Penalties are dished out for non-completion (something I have to admit to – more of that later!) But above all, despite the leaderboard providing some healthy (okay, perhaps not so healthy) com-pie-tition, this is a social gathering with a heavy pie focus. And that’s just how we like it! It does, after all, have a strong resonance with how Pierate Pie Reviews started. A group of friends meeting up and enjoying pies. Turning from a “bit of fun” to a slightly more serious “bit of fun”! The creation of a pie and mash trophy – handed to 2014/15 season champion Chris – was just a small competitive part of a largely informal and light hearted afternoon. Conversation ranged from bicycle manufacturing to the surprisingly sunny weather (come on, we’re British!!!) but the focus, oddly enough, was pies! 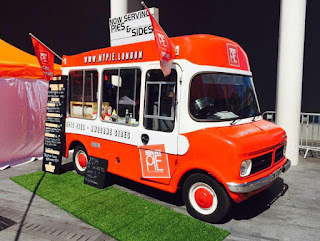 The sad demise of a few local traditional pie and mash shops offset with the celebration of a number of new openings, plus the successful start for The London Pie and Mash Company, who you may have seen were pie providers to our 5th Birthday Pie-rty last year. All in all it was a very enjoyable afternoon chatting pie to a group of pie enthusiasts, some of whom would have been enjoying pie and mash years before I was even born! My only disappointment was, slightly controversially, how poor the pie and mash actually was! It was my first time at this particular M. Manze in Chapel Market, Islington and it did disappoint compared to some of the traditional pie and mash shops I’ve visited. 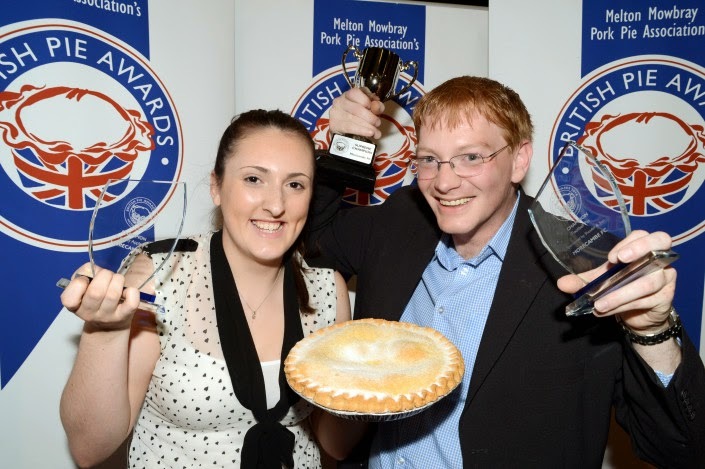 I have to say I am no expert in this niche of the pie world, with Pierateer Sam being our expert and writing our very informative Traditional Pie and Mash article. I’m going to have to leave it to his expertise to rank it against the many others he has had – but the highly soggy underside, split side and very chewy and gristly mince filling was one I didn’t really enjoy. I attempted 3 pies but only managed just over 2 of them. Even the pie and mash experts around me were rather disappointed by the pies and service there, though they still managed to tuck away more than me! Click here to read the full report for 25th September on the Pie and Mash Club website, featuring their leaderboard after one event! Still discussing pies in the pub afterwards! For them, it’s always a quick turnaround before their next meet up approximately three weeks’ later, once again at their infamous meet time of 13:11. For me? Well I just hope I can bring myself to rate another (hopefully far better) Traditional London pie and mash again soon. I’d like to take this op-pie-tunity to thank the Pie and Mash club for welcoming me with open arms to their regular pie meet up. They made me feel like a regular and the pub trip afterwards was a great way to get to get to know them better. Nick does a great job of organising the group but such a gathering only works if everyone plays their part. Well done to all those who regularly participate in this regular celebration of pie. Long may it continue! Thanks to Mike Goldwater for supplying the photos taken at the event – far more of them can be found in the report for 25th September on the Pie and Mash Club website. continue reading "London Pies with the legendary Pie and Mash Club"
It’s always great to be approached by pie producers asking us to rate their pies – but rarely do we get approached by anyone with as much TV exposure as the Radford family. For those who don’t know, the Radford’s featured on Channel 4’s 15, 16, 17 and now “18 kids and counting” and are – as you might guess – one of the largest families in the UK! 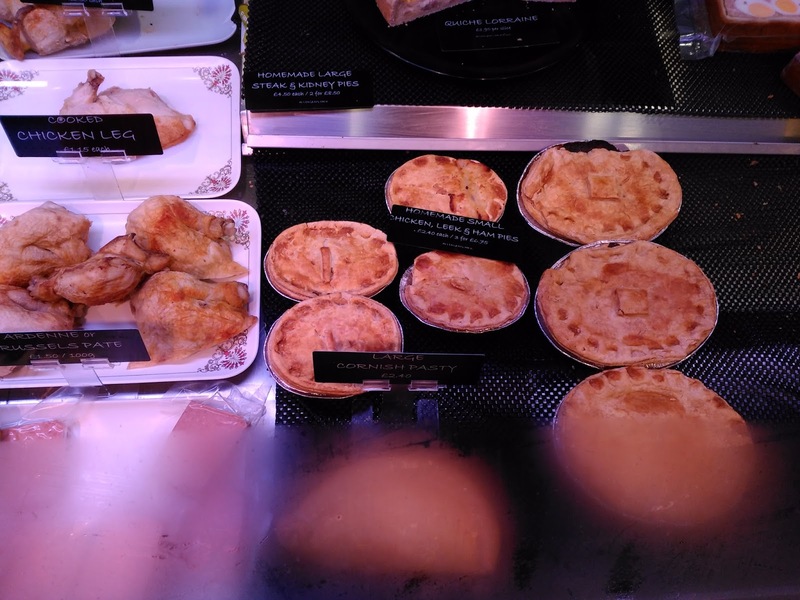 With so many mouths to feed, you can imagine the pie consumption must be pretty high in their house up in Lancashire, but it helps that the family run bakery – which supports the continually growing family - sells, amongst other things, pies! However while they’ve been selling pies in their shop in Heysham for around 15 years now and dad Noel has worked in bakeries for much longer, their latest exciting venture is offering home delivery of those pies, so that more people across the land can tuck into their exciting bakes! It’s great to see a family run business doing well and expanding their delivery options and we wish them continued success in this! 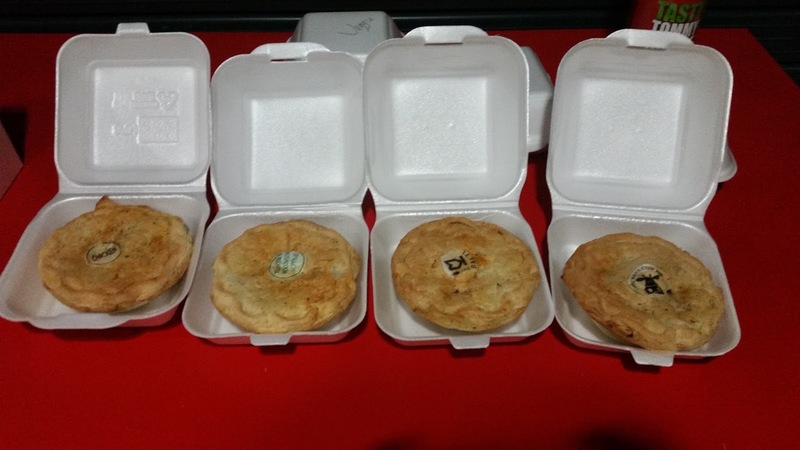 So having been sent some pies, how do the pies rate? Made with shortcrust pastry, one of the more obvious things you notice about them is they are packed near to capacity when you cut through them. They all travelled well, important for a home delivery pie, holding their shape well when cooked and removed from the foil. One interesting thing to note was that while the instructions recommended cooking them in the foil, I tried one of the steak pies cooked out of the foil and it really helped firm up the base of the pie, making it crisper and firmer than the steak pie I’d cooked in foil. However whether cooked in foil or not they all held together pretty well for a shortcrust pastry pie, some of which can crumble quite heavily upon biting into. The crimped edge added a slightly firmer crunch and the pies were all golden colour. Large chunky pieces of steak, just as the label promised! The meat was quite nice and tender, though a few pieces could have been a little leaner. However it was very meaty, with 45% beef steak. 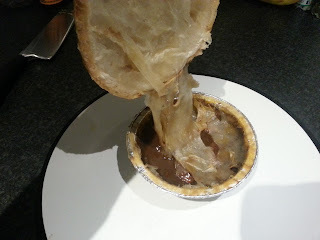 The gravy was quite a nice thickness, making it quite moist to contrast with the quite crisp outer pastry, which being shortcrust was a little dry in places. 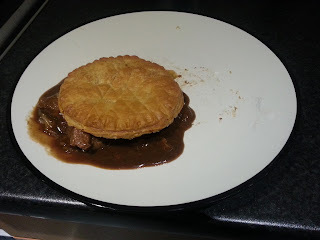 The thick chunks of meat and moisture of the gravy did seem to mean in places the base of the pie didn’t crisp up quite as well as the rest of the pie. 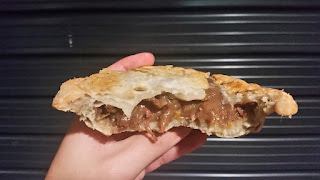 At 40% beef steak, this pie is firmly focused on the meat, which is my kind of steak and mushroom filling! The mushroom was nice and spread throughout the pie, though not a lot in there. The gravy was quite rich and meaty, not overly runny and the meat in quite large chunks. 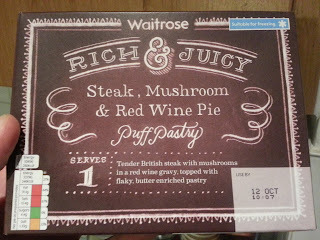 A nice, if quite subtle, change on the Chunky Steak pie. The meat and potato pie was very potato focused, with a nice texture to the potato in decent chunks, however the mince beef was quite lacking at just 11%. It meant the gravy wasn’t that rich in flavour and there was less fluid gravy in the pie, possibly due to absorption into the potato. The pastry was crisp and held together better in this pie, with a firmer and crisper base. For those who like a heavier potato content to their meat and potato pie this would be just up your street, but for me there wasn’t quite the right balance to really get my teeth into any of the meat. 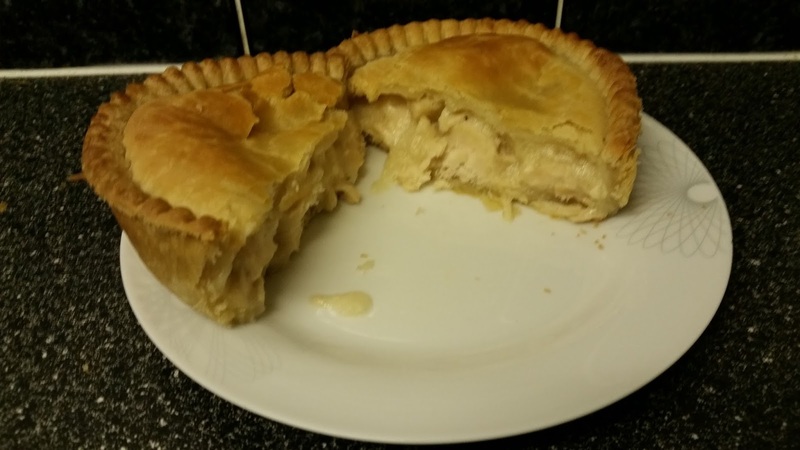 With this pie consisting of 41% chicken breast, the pie certainly wasn’t lacking in meat either and top of the range meat at that. 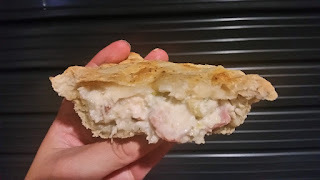 It was a very enjoyable pie, with my only suggestion that the pieces of chicken were quite chunky and thus not quite as succulent as it could have been if perhaps in slightly more small pieces. However the cream sauce was good, adding a nice blend to the flavour, so I think would have blended perfectly with the chicken if it had been mixed in with smaller pieces of meat. Excellent capacity and good content means this one just pips the rest. 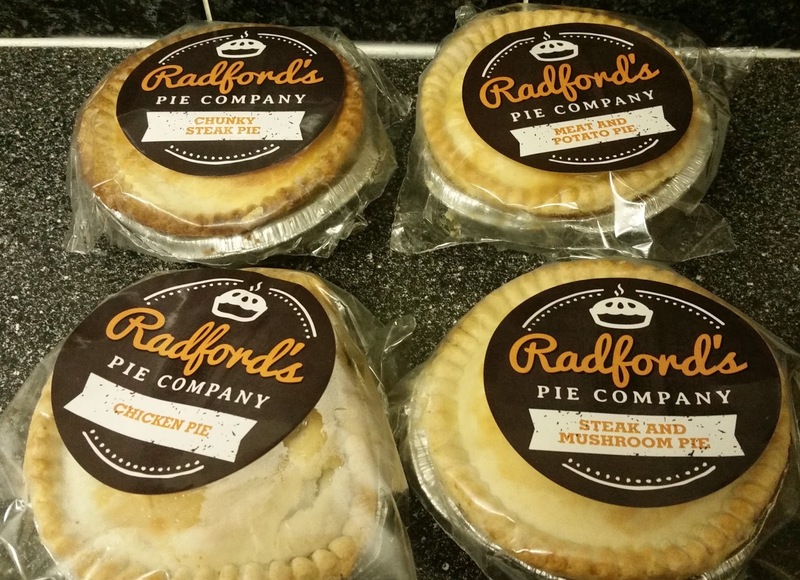 All in all, some very good pies from Radford’s and it’s a luxury to find a fully family run business like this that uses ingredients from local producers in the area. Worth getting online and ordering a batch for sure, as they are Pierate Recommended! continue reading "TV's Radford Family expand pie business"
continue reading "Fun of the Farmhouse"
As the BBC Price of Football Survey launched again this year we gave our opinion on BBC Radio 5 Live, sharing our expertise on the many pies we've rated and our number one football pie - from Morecambe FC. When you think football, you think half time pie. What better during those cold, winter evenings to warm the heart, as well as the hands, during the half time interval as you watch your local team? But is that actually what people do? 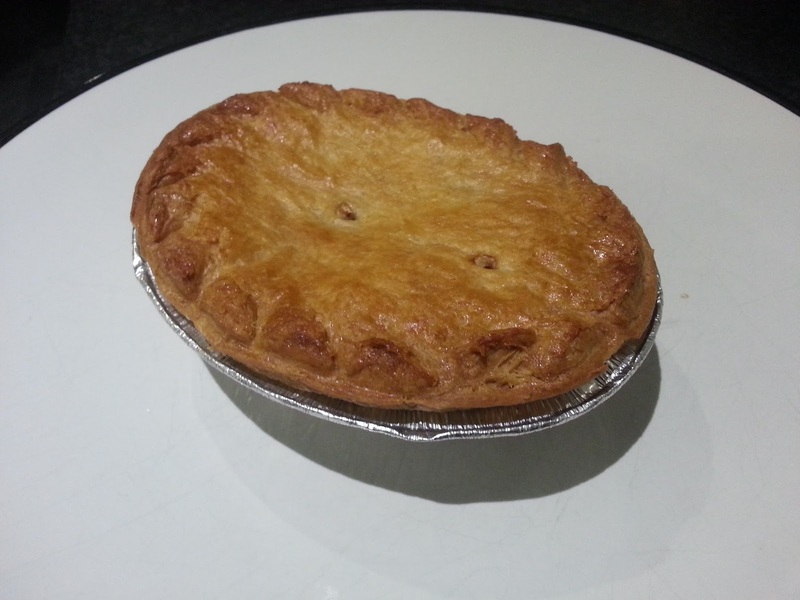 Or has the price of football pies put off the regular football fan? Do the caterers even have enough pies to go round? And if fans do buy a pie, is it piefection or are football fans being held to ransom? 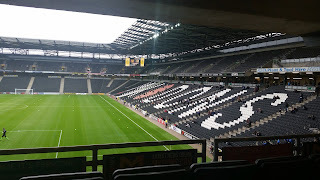 We were interviewed on BBC Radio 5 Live as part of their discussion on the BBC Price of Football survey, particularly focusing on the quality of pies being provided at grounds and questioning why we are paying so much for often quite average pies, at a time when the top clubs in England are getting millions of pounds in additional TV revenue! In particular was the surprise that pie prices in the Premier League have gone up 1.82% in the last year, as highlighted in the Price of Football stats article. While some of this increased is put down to the clubs selling more artisan and high quality pies - something we support - there are a number of grounds who sell the same pies as each other but at quite significant differences in price! 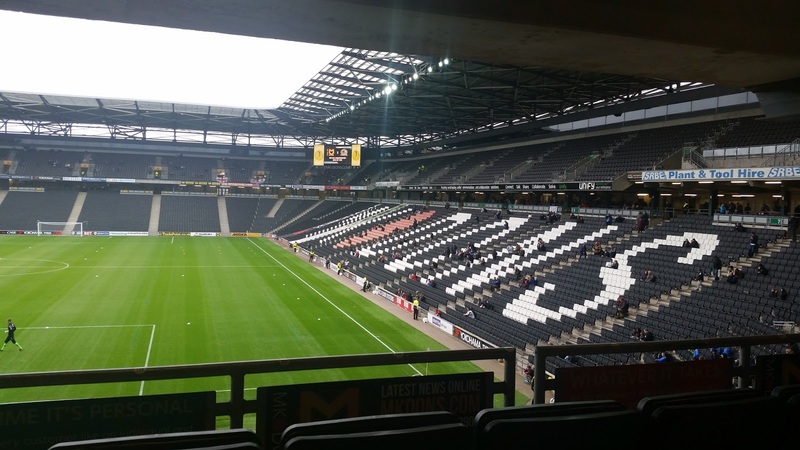 Listen in to Pierateer Rob talking football pies on BBC Radio 5 Live from minute 42 to 52 - discussing the quality and price of pies in football. Also continue listening in to minute 66 of the programme to hear a pie-related poem on the Price of Football by Jeremy! You may remember last year we joined BBC Sport's Azi Farni at Morecambe FC, who make some of the best pies rated on Pierate (let alone football grounds) to discuss what makes the perfect football pie! 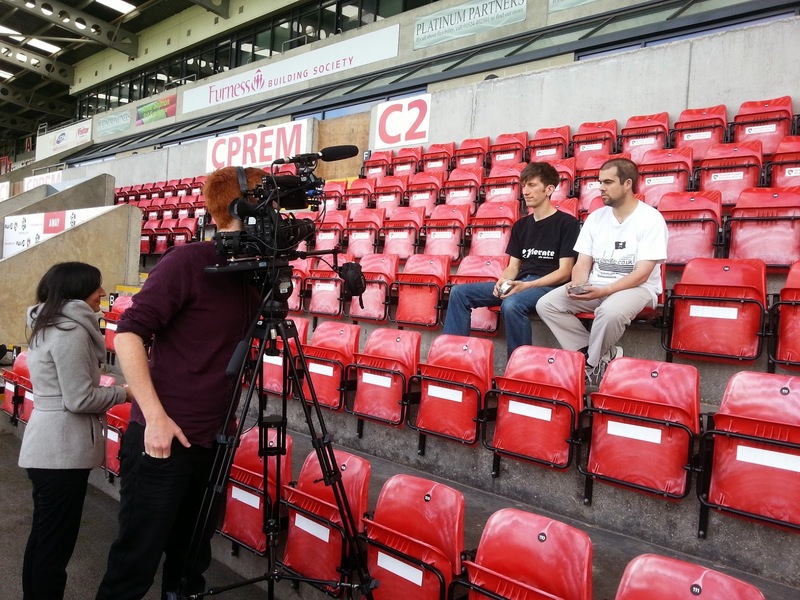 Watch us featuring in the BBC Price of Football video here. 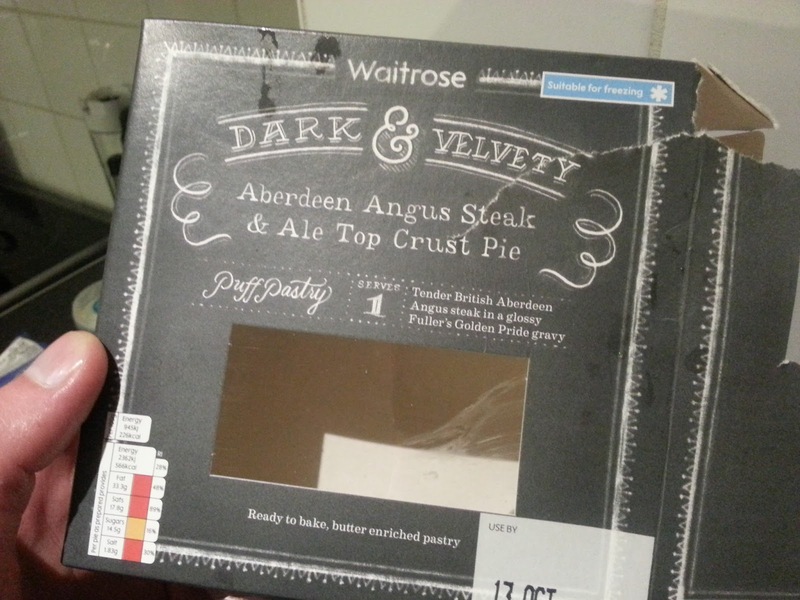 In our view, it’s all about a great tasting pie – filling and pastry - which is value for money. 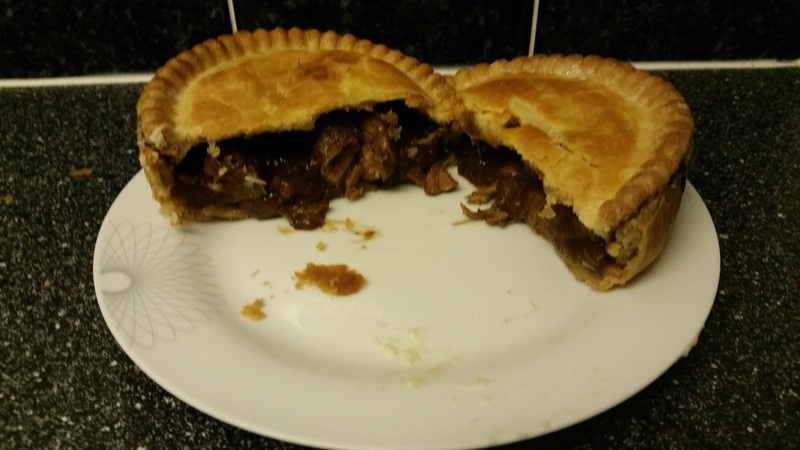 You can find out more about what makes a great rated football pie by reading our article on the Pies of Football from last year. 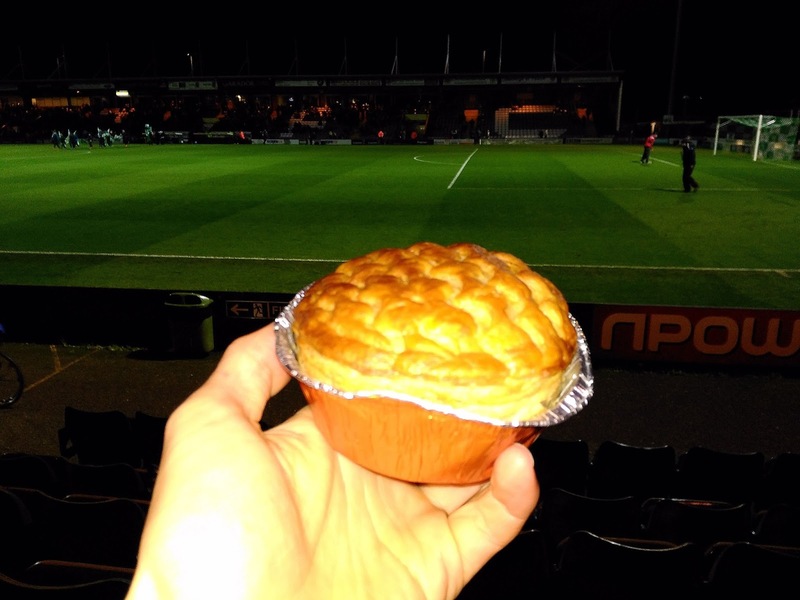 Once again the #PriceOfFootball survey highlights that Kidderminster is the most expensive half time pie at £4.50. While some Kidderminister fans have already taken to Twitter to criticise the BBC for not pointing out it is more of a meal than just a pie, what they fail to point out is a far more important issue - they are selling a Potato bake and not a fully encased in pastry pie! 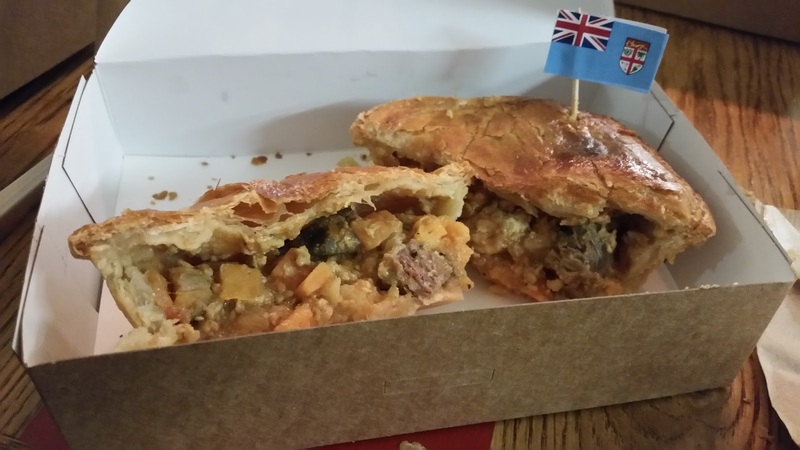 continue reading "Pierate advises BBC 5 Live on the Pies of Football"
Square Pie try something different with Rugby World Cup! 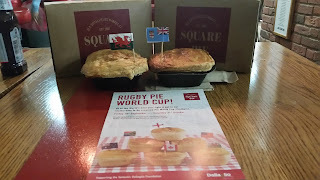 Here at Pierate HQ we’re always big fans of a pie-motion, like the tie in of the Rugby World Cup happening in England with the “Rugby Pie World Cup” happening down at Square Pie right now! The idea is pretty simple – there’s a new pie to represent each of the 20 competing nations in the Rugby World Cup 2015, which are trying to be crowned the Pie World Cup Champion! Just like the competing rugby nations, the pies are being put through their paces and pitted against each other in a group phase and eventual knock out com-pie-tition, based on pie sales. Intriguing flavours include Chicken Teriyaki for Japan, Springbok Sausage for South Africa and Moose for Canada! It’s also great to see money being raised for the Dallaglio Foundation as part of the contest. More info can be found on the Square Pie website. Overall – The pastry on all three of these pies held together well, all passing the hand-held test (even if the Steak and Ale was a bit less firm than the others due to the more liquid filling making the base pastry a bit softer). I was impressed that none of these had soggy bottoms though, particularly with the gravy in the steak and ale. 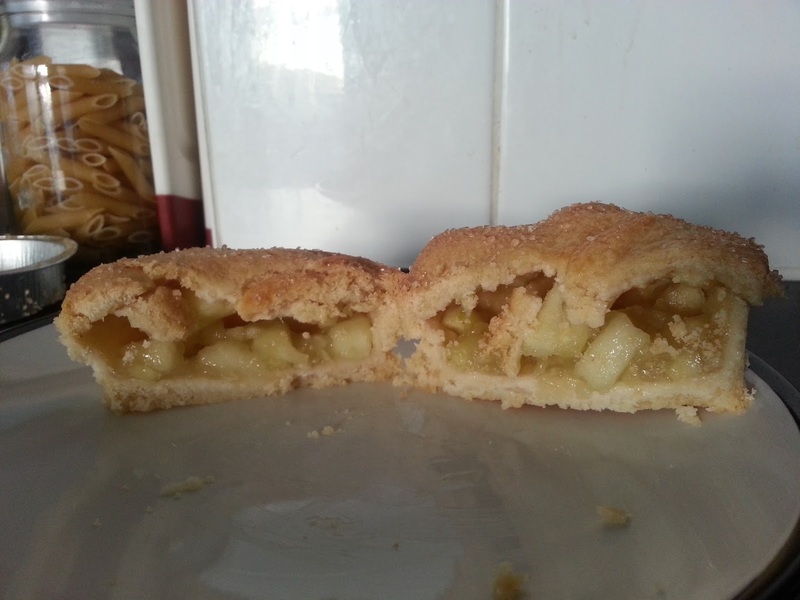 The pastry lid was particularly flaky and crisp on all three. 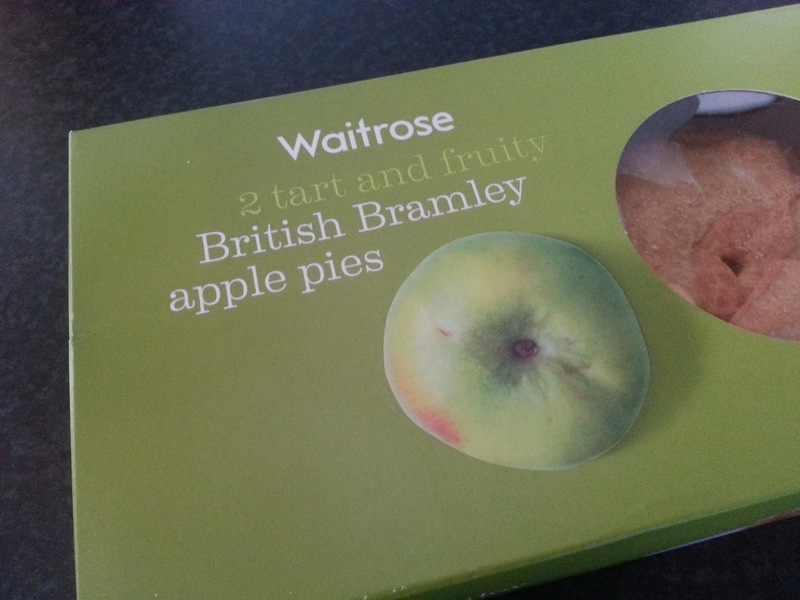 There was a bit of a pastry overhang on the lids of these pies and by the time you got to the corners of the pies there was a bit too much pastry to filling – but there’s not really a way of avoiding this in a square product and this doesn’t detract much from the overall enjoyment. All these special Rugby World Cup pies are the same price as their standard pie range, which I think is quite commendable seeing as, being quite unique flavours, they would be made in smaller, less frequent batches. 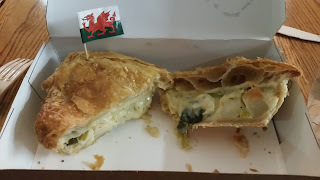 However at £4.50 for just a pie or £6.50 for a classic meal (pie and 2 regular sides or pie and one large side) prices them as a bit expensive for just a hot pie or meal takeaway, but a reasonably priced option for a restaurant pie. It has to also be remembered that you are in the heart of Birmingham, minutes away from the central train station. 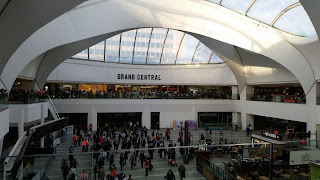 There is very much a takeaway vibe to the Grand Central Square Pie shop, with food served in a box to go or eat in their array of seating – both useful options for those using the pie shop to ‘grab and go’ before getting a train. I know I will be! There were big potato chunks in the pie, which were quite well cooked, soft and tasty without being mushy. The cheese was noticeable and added flavour alongside the leek, but could have been a bit stronger. 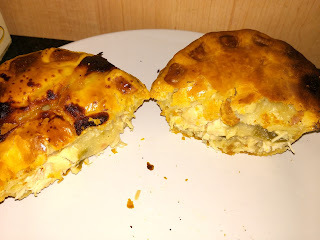 There wasn’t really anything to get your teeth into with this pie though, as a result of the potato being quite soft alongside the cheese and leek. This and the runny sauce contrasted quite strongly with the crisp pastry. Slightly smaller chunks of potato and a bit more cheese would have improved this pie a bit. A decent vegetarian pie but quite a standard flavour. 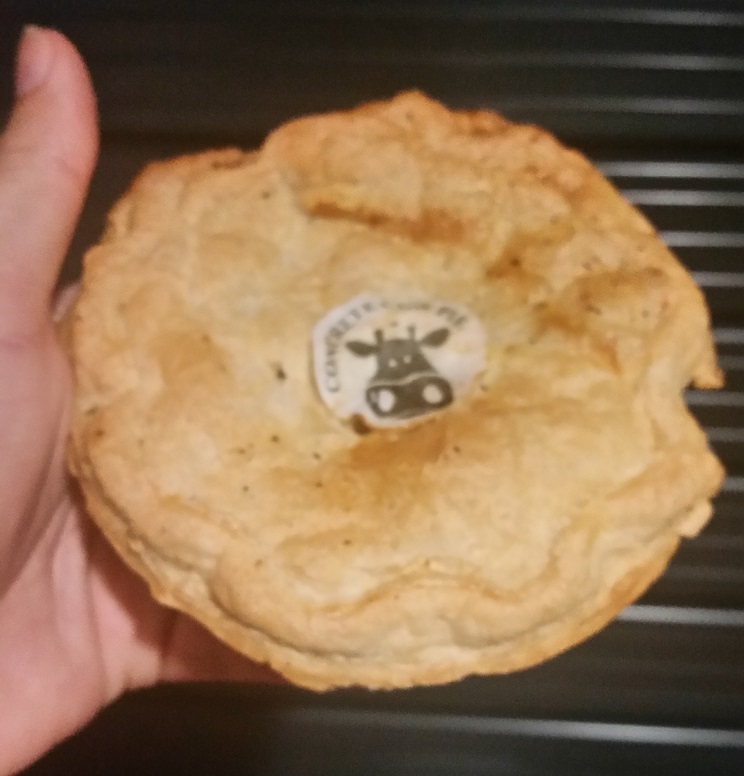 One of the more unique flavours in the Rugby Pie World Cup, the Goat Curry pie was an interesting one to get my hands on! 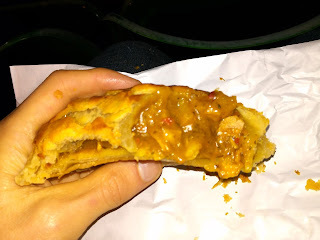 I’d only had a goat pie once before but that was in a gravy based pie, so the goat curry pie was a lot more dry in comparison to that. The ingredients in the pie apart from the meat were quite moist but there was no real sauce, which meant that the dryness of the meat was quite evident. This isn’t that surprising given my prior experience with goat, which is quite fatty but chewy and quite a dry meat, but this perhaps could have been factored into the pie filling. The meat was also in quite large chunks, which would have been better served spread out in more, smaller chunks in my opinion. The curry flavour was quite mild but added some flavour. I recognise goat is not the easiest meat to prepare well and overall didn’t mind this pie flavour, but a bit more flavour and leaner, tender meat would improve the pie rating. The steak and ale pie is a classic English flavour, so it’s no sur-pies to see the English pie filled with it. There’s no denying it is a flavour we love here on the Pierate Ship, but that does mean with so many good steak pies eaten the bar is very high. However it was a good hearty effort, with a significant ale flavoured gravy. The gravy was very runny though, which did seem to make the pastry less crisp and sag slightly under the moisture. It was still able to be picked up by hand though, with a fair bit of steak and other filler such as onion to bulk it out. A bit more steak, which was slightly less chewy, and a lower viscosity gravy would raise this even higher up the rankings but still Pierate Recommended. 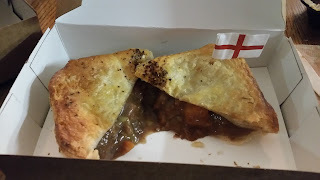 Overall, we’re delighted there is a great new pie shop in the centre of Birmingham and the Rugby Pie World Cup is an ingenious idea to boost the range of pies on sale at Square Pie. With the board on the wall in the Birmingham shop celebrating the 127 flavours of pies made since 2001 – though now needing a massive overhaul following the 20 new types of pie during this Rugby Pie World Cup alone! – it seems clear pies are in good hands at Square Pie! 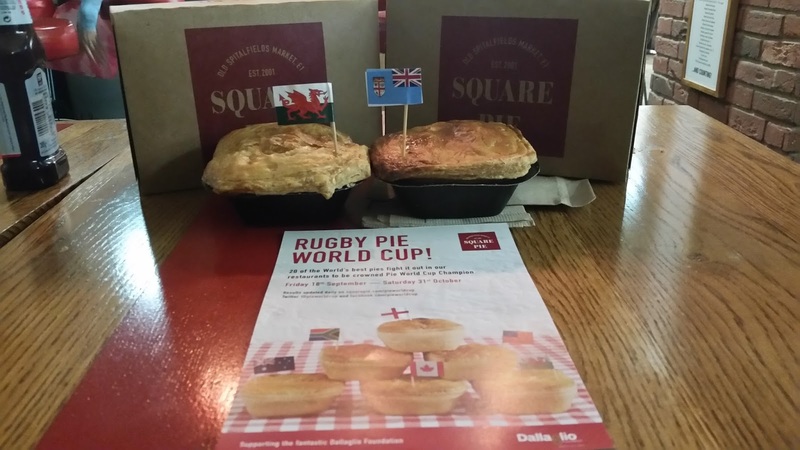 Thank you to Square Pie for hosting us for this Rugby World Cup Pie-Off in Birmingham. We'd already bought and rated Square Pie as Pierate Recommended as we celebrated eating our 100th rated pie there down in London back in 2012, and in 2013 we rated their Chicken, Leak and Wiltshire Ham pie at 5.58/7, which was another Pierate Recommended effort. 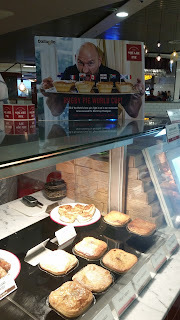 continue reading "Square Pie try something different with Rugby World Cup!"